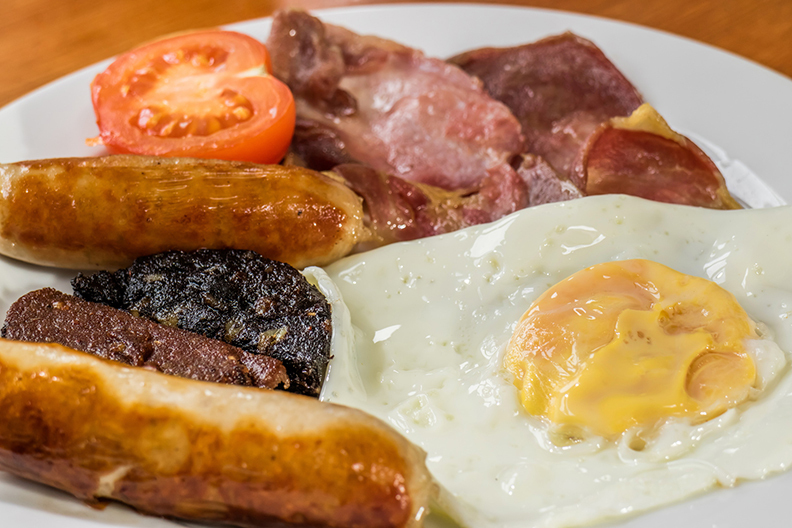 A british breakfast consists of a lot of fried food. Sausage, bacon, egg and mushrooms are all fried in oil, so another high calorie meal from England. We typically eat these on a weekend as they take such a long time to prepare. Other items on the breakfast includes toast, baked beans and black pudding! Black pudding is a blood sausage made from pigs blood and entrails and it’s incredible popular among British and Irish men. Crumpets are enjoyed with afternoon tea. Crumpets are a harder and chewier version on a pancake. They have pores (holes) all over them and are usually warmed up in a toaster and servied with a knob of butter. Variants include topping your crumpet with jam, honey or chocolate spread, depending on your preference. Trifle in English cuisine is a dessert made with fruit, a thin layer of sponge fingers or sponge cake soaked in sherry or another fortified wine, and custard. It can be topped with whipped cream. The fruit and sponge layers may be suspended in fruit-flavoured jelly, and these ingredients are usually arranged to produce three or four layers. There’s no particular time that we enjoy this but it’s definetly a classic dessert. Fruits which are most commonly used are strawberrys and raspberrys. This is one of my favourites!